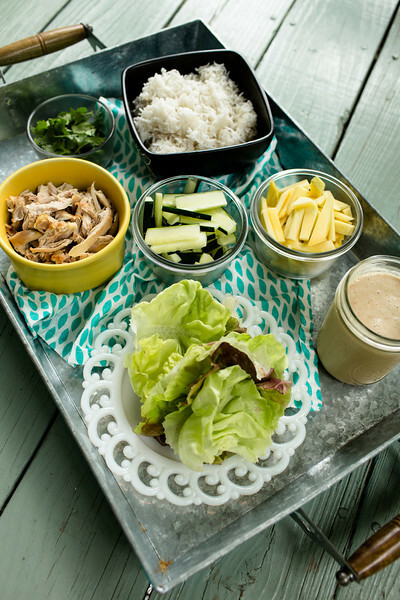 This chicken, rice, and mango lettuce wrap is so easy and delicious! It’s a great use for rotisserie chicken! Post may contain affiliate links. Are you lured by the smell of the grocery store fried chicken as it wafts across the store? It smells so good. Then you get it home and you eat a couple of pieces and it’s okay. Good, but not great. So you store the rest in the fridge, and you know it’s not going to magically get any better by tomorrow. As a matter of fact, the quality goes down hill fast. I admit this has happened enough times that you think I would have learned, but nope, I believe in practicing my mistakes until I get really, really good at them. There I was sitting with leftover not-so-great fried chicken. I decided to rip off the breading and see if I could use the cooked chicken in a recipe. I learned two things: one – oh my gosh, that big box of fried chicken is about 90% breading!! Seriously. Try it sometime. And second, fried chicken meat (at least from the grocery store) is not the same as rotisserie – it needs that breading to disguise the fact that the meat is not very moist. Pretty dry actually. I needed a recipe with lots of fresh flavors to brighten up this lackluster chicken. 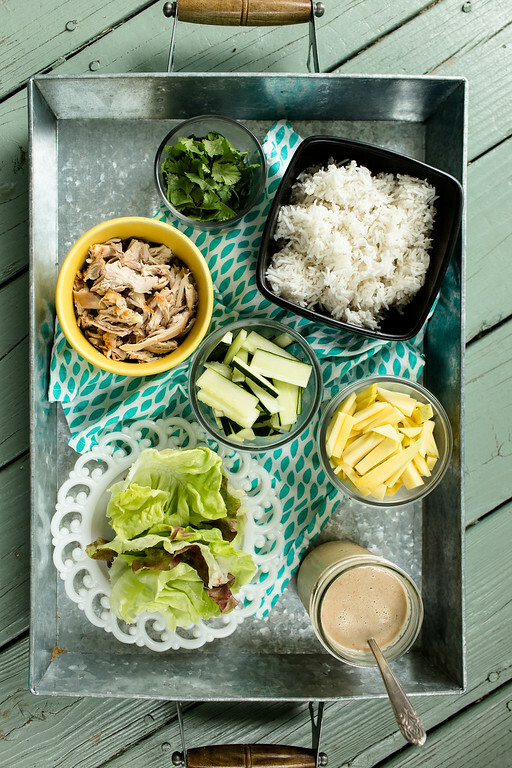 In Gourmet Today: More than 1000 All-New Recipes for the Contemporary Kitchen I found Chicken, Rice, and Mango Lettuce Wraps. It sounded perfect and it was. It’s such a fun meal! I put all the ingredients on this big tray in between Mr. Sidewalk Shoes and I, and we just made them and ate them one right after the other until we ran out of chicken! The flavors are crisp and clean and the dressing is to die for! The recipe makes plenty of dressing and I used it in a recipe that I’ll be sharing on Friday. I was going to type in the recipe for you and then I remembered it’s from Gourmet – which means it’s probably on Epicurious – and it was – Chicken, Rice, and Mango Lettuce Wraps. Seriously. Make these. You’re welcome. 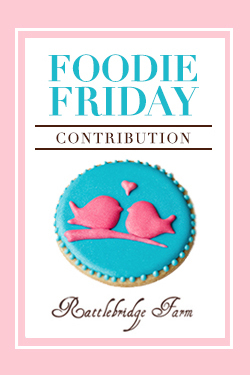 This will be my entry for Foodie Friday at the every so lovely Rattlebridge Farm. I’m honored to be on your board! Now, I must go check it out, because I love wraps! i don’t make use of mango enough, and this is a delightful way to start eating more! beautiful and delicious display! Everytime I have mangoes, I am reminded of how good they are! I don’t have “not so good” fried chicken in the ‘fridge but I often have leftover smoked chicken and this would be a divine way to use it up! Thanks for the idea, Pam. Oh, it would be amazing with leftover smoked chicken! Boo on bad fried chicken! I feel like that’s just a travesty to begin with, but you’ve really turned it around with these wraps! I think this recipe made the fried chicken the best that it could be!